Velvet Pants: Frame. Boots: Old, but very similar here for under $150. Corduroy Blazer: Veronica Beard. Coat: Topshop (also in Lilac and Pink! Also similar here). Sweater: Old, similar here (also in pink). Scarf: Mark and Graham (similar). Belt (similar under $50) Thank you to Nordstrom for partnering on this post! Are you kidding me!!! Seriously your photos make my jaw drop sometimes — this was one of them! So good. Thank you for sharing your superb style, Blair! I love the boots, they are just perfect for Fall! Beautiful photos… Everything looks like an enchanting Fall dream! Gorgeous! That coat looks so soft and fuzzy. Must be super comfortable! I love how homey this is! Those pants are awesome! 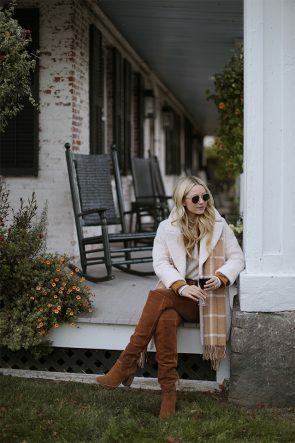 This is so cozy and so cute for Fall! Love that coat! this is the perfect fall look! love your pants and boots! I am totally in love with this look! Those boots look absolutely fab on you! soooo cozy, head to toe! Me encanta el look, sencillo y en tonos tierra, ideal para el otoño. So elegant for the actual season! 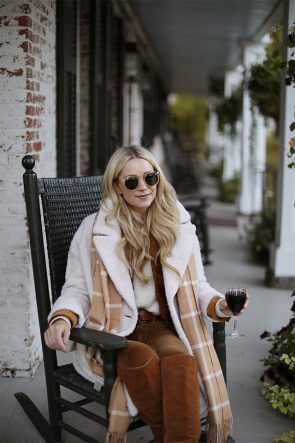 This is the ultimate fall look! I can’t get enough of those velvet pants! I love this look! Just ordered a coat similar to yours, so I’m excited to see a new way to style it. Fall is the best season of all seasons. Loving the way you layer shades of cream & tan together! This is a great cozy fall look ! The boucle’ coat is a classic design , buy it once wear it years ! Love how the pants and boots match so well, it’s such a great look! Great outfit and beautiful photos in a stunning scenery! Gorgeous outfit! Love the neutral tones and it just looks so cozy! I’m going to Warren, Woodstock and Stowe tomorrow! Any suggestions on great restaurants, coffee shops, etc? Your outfits are ALWAYS 10/10, but you already knew that. Can you please say where your sunglasses are from? They are EXACTLY what I’m looking for. Stay fab!